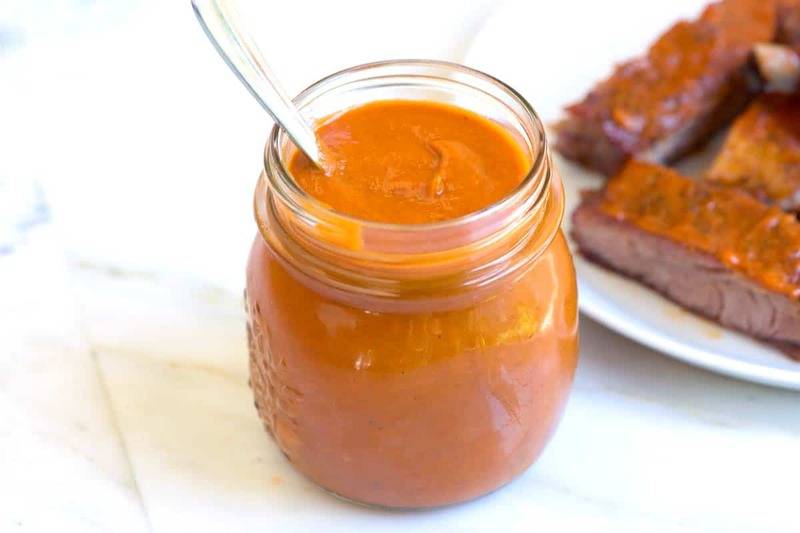 Skip the store-bought bottle and give this homemade barbecue sauce laced with bacon and bourbon a try. 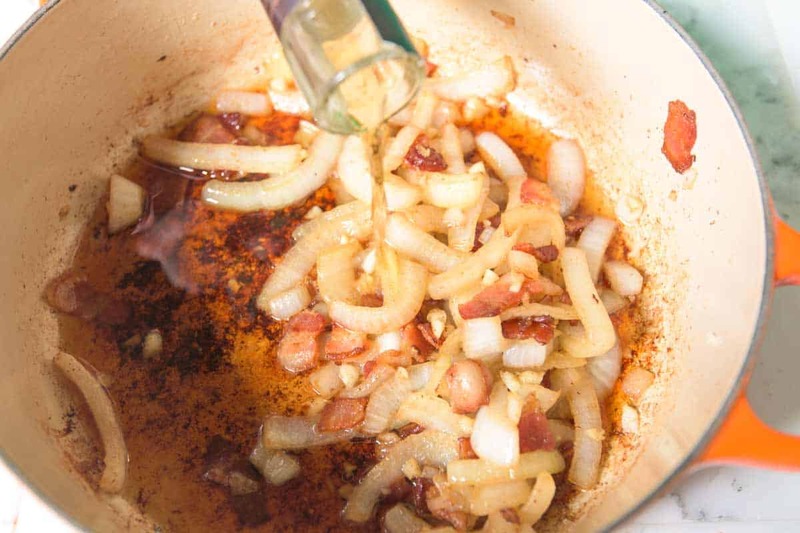 Jump to the Bacon Bourbon Barbecue Sauce Recipe or read on to see our tips for making it. Yep you read that right, bacon AND bourbon. The combo is insane. Remember that homemade ketchup we shared? Ever since then, we’ve been up to our elbows experimenting with homemade barbecue sauces. The moment we came up with this recipe, we knew we had to share it with you. It is definitely our current favorite and is made completely from scratch. 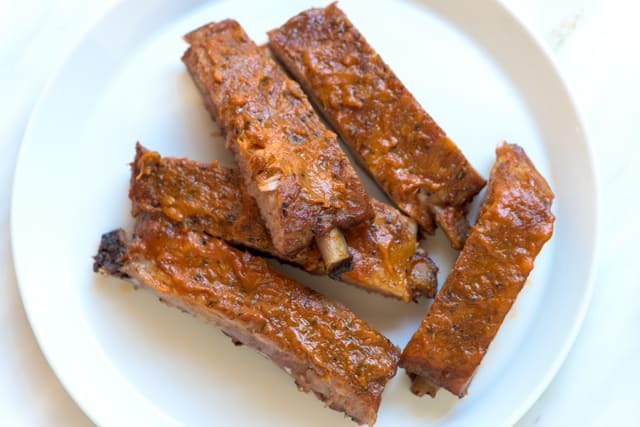 YOU MAY ALSO LIKE: There are lots of ways to use the sauce, but slathering it on pork ribs is a good start! See our recipe for Bacon Bourbon Oven Baked Ribs — they are so tender they practically fall of the bone. The barbecue sauce is simple, too — no complicated ingredients and less time in front of the stove than you might think. This is a must try, especially if you’re into bourbon and bacon! It’s no surprise that this recipe starts with bacon. All the fat needs to render — we like using our dutch oven since it’s wide enough for the bacon to be in one layer. Once the bacon has rendered, you have two options. Option 1 is to remove the bacon and leave the fat. This will make a barbecue sauce that’s got a tiny hint of smoky bacon. Option 2 is to leave the bacon in and blend it into the sauce in the end. We go for option 2 and love blending the bacon into the sauce since we love having that bacon punch in the final sauce. After the bacon, we add some onions, garlic and a little smokiness from cumin. Then comes the bourbon — we go for a mid-range bottle. There’s no need to splurge, here. Don’t go for the most expensive bottle, but make sure you choose something you actually like the taste of. This time we used Woodford Reserve, but use what you love. And finally, we add the rest of the ingredients: a can of tomatoes, some mustard, sugar, molasses and spices. After about 20 minutes, you get this — basically, a bubbling pot of awesome. And after a quick blend, you get this. A smoky, bourbon laced sauce ready for ribs, chicken and pork. 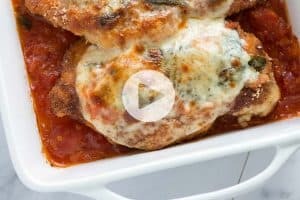 Bonus: The barbecue sauce lasts about a week in the fridge or up to a month in the freezer. So you should probably go ahead and make a batch now. You’ll thank yourself later. 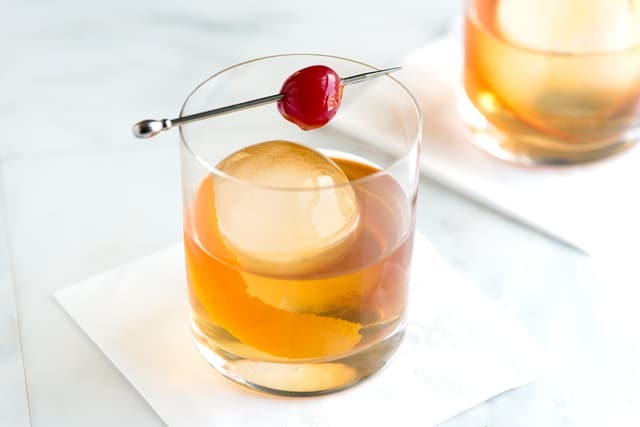 Just in case you have leftover Bourbon, you might be interested in how we make one of our favorite cocktails, The Old Fashioned. 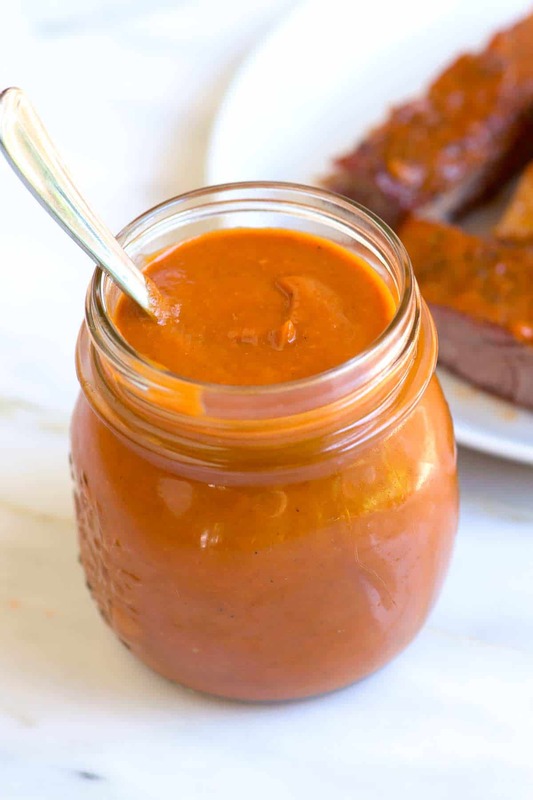 Making your own homemade barbecue sauce is much simpler than you might think. This version is laced with smoky bacon and bourbon. Use a bourbon you like, but there’s no need to splurge when it comes to price — we go for mid-range, ourselves. Arrange bacon, in one layer, at the bottom of a wide, heavy-bottomed pan. Place the pan over medium heat and cook bacon until the fat has rendered and bacon is browned, but not crispy; about 8 minutes. Check the amount of fat that has rendered and remove all but 2 tablespoons from the pan. You have the choice to remove or leave the bacon, see our note below about whether or not you should remove the bacon or leave it in. Add onions and cook until softened, about 5 minutes. Add garlic and cumin then cook, stirring often, until fragrant, about 2 minutes. Stir in the remaining ingredients, bring to a boil then reduce to a low simmer. 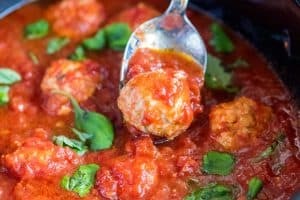 Cook at a low simmer until the sauce has thickened slightly (a good visual is when the sauce can hold a line on the back of a spoon when you drag a finger through it), about 25 minutes. Taste sauce for seasoning then adjust with additional salt, pepper or sugar as needed. Remove from the heat then blend until smooth. Let cool to room temperature then refrigerate up to one week or freeze up to one month. Take the Bacon out, or Leave it in? 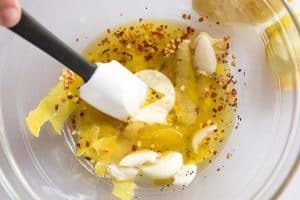 You have two options for this sauce, the first is to only use bacon fat rendered in the beginning of the recipe and remove the cooked bacon to munch on as a snack or use elsewhere. The second is to leave the bacon in the sauce and blend it into the final sauce. Both are delicious, but blending the bacon into the sauce makes the sauce taste much more like bacon. A note about blending: You can use an immersion blender or regular blender. If you use a regular blender, it is best to blend in batches and not fill the blender as much as you usually would since the bbq sauce is so hot. We like to remove the center insert of the lid and cover it with a kitchen towel while blending — this helps some of the steam release and prevents the lid from popping off (which can be a big, hot mess). I tried this and (I’m pretty sure) folowed the recipe to the letter, however it seems to taste more like a pasta sauce than a barbeque sauce. I guess the tomatoes are overpowering the rest of the ingredients? I’m not sure, but I don’t want to give up on this recipe. 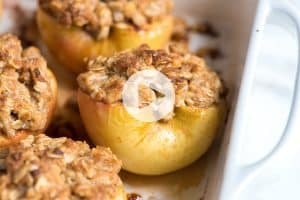 Any idea how to balance the flavor a little more? Or is this how the sauce was intended to taste? Hi Jacob, You can try increasing the amount of bourbon or add some vinegar to the sauce. The vinegar (or more bourbon) will cut the tomatoes. 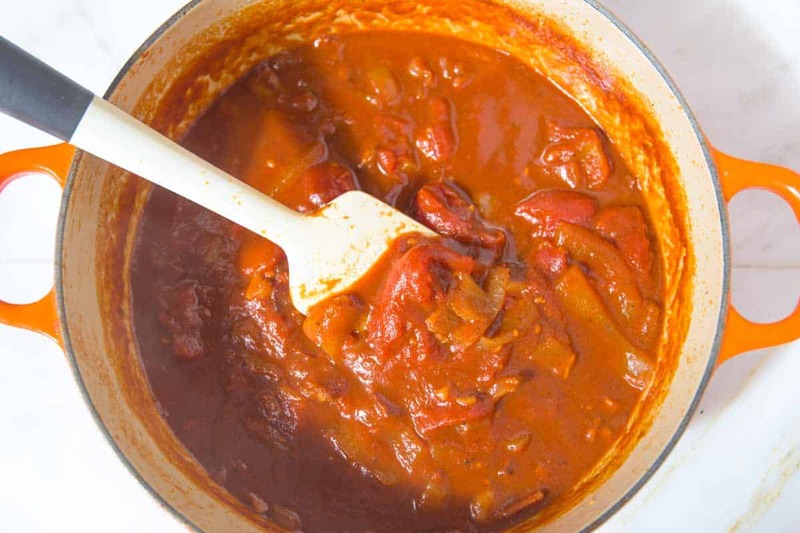 You could also reduce the amount of tomatoes called for — try only using about 3/4 of the can. My advice is to substitute the 28 oz. tomatoes for 2 cups Heinz ketchup, will taste more like barbeque sauce and not like marinara.